VMware Horizon View delivers full Windows VDI, hosted session desktops, as well as applications, to meet the demands of an expansive variety of use cases, allowing employees to access their apps, desktops and data without the limitations of traditional Windows® desktop solutions. VMware’s Horizon View desktop platform attempts to solve Windows delivery and desktop challenges for customers. In order to make the VMware desktop experience seamless for end users and desktop administrators, VMware currently provides basic solutions that solve some longstanding Windows challenges in two key areas – User Profile Management and Application Layering. Liquidware – a long time VMware Technology Alliance Partner – also offers solutions that address the challenges of User Profile Management and Application Layering in Windows desktop environments. ProfileUnity offers full-featured User Environment Management (which encompasses User Profile Management). FlexApp, which can be integrated with ProfileUnity or used as a stand-alone solution, addresses the area of Application Layering. This paper initially covers the topics of profile management and user environment management, and then shifts focus to Application Layering. The purpose of this document is to outline the typical uses cases for the VMware solutions, and then go on to explain when it is more appropriate to utilize the more sophisticated ProfileUnity with FlexApp solution to more completely address gaps in the desktop environment. VMware UEM and App Volumes layering is available to VMware Horizon View Enterprise level customers. The Enterprise license of Horizon costs $121 more than the advanced license. This higher price largely adds in VMware User Environment Management, App Volumes Application Layering, and some monitoring capabilities. The price and functionality difference of Horizon Advanced compared to Horizon Enterprise can be directly compared with the Liquidware leading Essentials Suite, which includes robust User Environment Management, Application Layering, and User Experience Monitoring/Diagnostics. Liquidware Essentials is only $79 per user while ProfileUnity and FlexApp is priced at $59 per user. 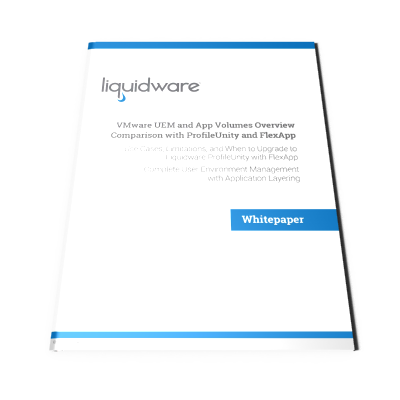 In this document you’ll learn how Liquidware provides many additional features over VMware for a lower cost. Note: Pricing accurate at the time of this document’s creation/publication.